In today's business world there are times when you have to be a team player. Most businesses work in teams now and the leaders of these teams are pretty competitors and want their guys to do the best they can to prove that not only are they the best in the building but also have the best leader. If you are team leader, or simply one of the team, and want to tell all your colleagues how great you think they all are and that you are 110% committed to the cause then this ecard is the perfect solution. 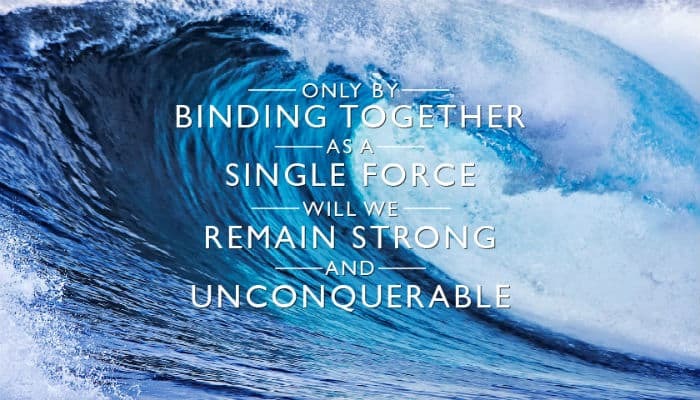 Entitled Teams Win, the corporate ecards portray a break wave that nothing will stop until it runs its course and dissipates of its own accord. This is the way you see your team and you want to let them know it. The legend across the front of the ecard reads; “Only by binding together as a single force will we remain strong and unconquerable”. Strong words for a strong sentiment. Everyone in a team needs to know that their contribution is appreciated and these little ecards dropping into their inbox will mean more than words ever could. They can also keep looking at it as well, especially if you have also added a personal message. Does your business send holiday greeting cards to clients at Christmas time? If so then please do consider our amazing electronic holiday cards for business.